Yesterday, after two sold-out shut-downs, I finally saw Snow White and the Huntsman. At our pre-screening dinner and drinks, my friend and I discussed what we’d heard about the movie so far: unexpectedly good, Charlize Theron is brilliant, an empowering feminist slant. Though neither of us had read it, we discussed an apparently well-known review of SWatH as the beginning of a new genre of feminist film, led (really??) by Kristen Stewart. After the movie, our collective response was: That constantly oscillated between expected and surprising! Daring ending! Strong female characters! Entirely unsubtle female Jesus figure! At home this morning, I attempted to find the review we had discussed through a brief Google search. I was resoundingly unsuccessful—instead, Googling “snow white and the huntsman feminism” results in a barrage of reviews bashing the movie for its misplaced feminist interpretation of the classic fairytale. In some scruffy, unbathed, unshaven, older-alcoholic way, the huntsman is supposed to make sense as Snow White’s true love. . . [I]t is his lesson about a knife to the heart that ultimately saves her. So, even though Snow White kills the Queen, he gave her the knowledge to do so. Her moment in armor? That was just a brief blip in drag. By film’s end, she is wrapped nicely back in a flouncy blood-red dress and will seemingly soon trip down the aisle with Sir Skirt Ripper. Gag. To my understanding, a feminist revamping of a fairytale does not (and probably should not) completely ignore the admittedly chauvinist lean of the original. Let’s face it—if I was running for my life through the Dark Forest, I would probably want someone with me. You say that you know a man who can wield a battleaxe, which straight-up physical fact makes a difficulty for me? Fine, male companion it is. Even Katniss—whom this blogger seems to regard as the paragon of feminist hero, an opinion I partially agree with but also find a little questionable—had almost constant male companionship or protection, especially in the second and third Hunger Games books. In any case. I am likely getting in over my head here. Suffice it to say that sometimes it is just pretty cool to watch a girl leap through a wall of fire in full sword-wielding armor. So both Sunday and Monday night, I made the mistake of starting a Hunger Games book after dinner. And then did not go to sleep until I had finished. It’s been a rough couple of days. My fellow Book Blobber Morgan recently “live-blogged” his experience reading Game of Thrones. My coworker lent me his copy of The Hunger Games and insisted I read it. In my head, these logically combined into me live-blogging THG. 2:08 p.m. Am I really starting this now? After everyone else has read it and raved? I probably won’t like it. Urgh. I’m nervous. 2:17 p.m. “Gale spreads the bread slices with the soft goat cheese.” Why would you write it that way? You spread the soft goat cheese ON the bread slices. I already don’t like Katniss. Or this writing. Urgh. 2:20 p.m. “We easily trade six of the fish for good bread, the other two for salt.” BUT YOU JUST SAID YOU CAUGHT 12 FISH. 2:25 p.m. Oh. Now you have 4 fish left. Still. Why did you say THE OTHER two? 2:44 p.m. Her family is saying goodbye to her so calmly! So weirded out right now. After 2:44 p.m., I was no longer able to force myself to put down the book long enough to write anything. And so ends my failed attempt at live-blogging. But here’s the thing: I never liked Katniss. I never liked the writing. And yet dear God I could not put this book down. That is how incredible the plot was. I know I’ve pretentiously nattered on here before about appreciating good writing and relating to characters, and how I can’t enjoy a book without that. Suzanne Collins floored me not only with her incredible storyline, but with proof that I was, in fact, wrong about this. I loved THG. Not to obsession, not to midnight-movie-premiere craze, but much more than I thought I would and enough to make me drool after my roomate’s copies of Catching Fire and Mockingjay. And enough to make me watch the preview and get goosebumps. 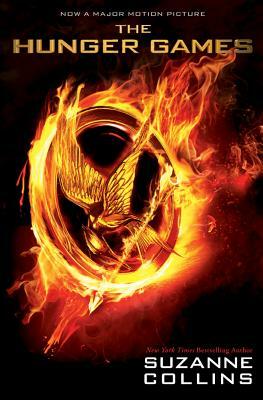 Here’s another way THG has turned me on my head: I read the book first, but I actually think I might enjoy the movie more (un. heard. of.). Take out the writing style and Katniss’s first-person narration, and what you are left with is a sheer unadulterated adrenaline rush. Thank you, cinema. In sum: I read the entire book and watched the trailer multiple times on Sunday afternoon. At work on Monday, I spent most of the day listening to the Dixie Chicks’ “Travelin’ Soldier” on repeat and trying not to indulge in tears of exciting emotion. So in a combination of wanting more variety to my posts (Death in the City of Light is STILL dragging out… SHEESH) and picking up some tips from other blogs I love, I’ve decided to add a weekly feature of Friday Favorites. Every Friday, I’ll post on a book, author, or series I consider to be at the top of my biblio-list. I like this plan, especially because I really don’t like blogging about books I read that I didn’t enjoy… and sometimes that happens. 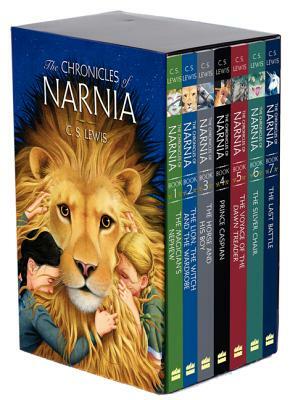 And how could I forgive my 8-year-old self if I didn’t start my list of favorites with the Chronicles of Narnia? I was pretty much obsessed with these books for the latter half of my elementary school career. I saved up my allowance quarters for weeks and bought the very boxed set you see pictured here out of the Scholastic book orders they handed out in school (remember those?). In a fourth-grade biography assignment, I researched and wrote about C. S. Lewis. 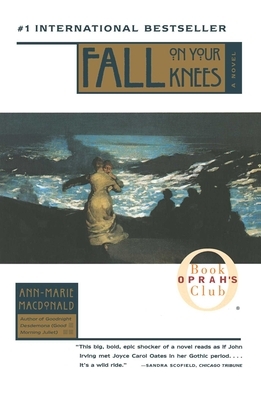 When I came home on breaks from college, I still reread them frequently. When I first read these, I was young enough that the Christian allegory didn’t sink in at all. I’m actually not sure how it would’ve changed my perception of the stories had that happened—as it is, they’ve always remained just amazing magical stories to me. And, like Harry Potter, they’re not just books for kids. In fact, IndieBound doesn’t even list them as children’s books. And who could forget the Lonely Island’s breakout hit?? I figure at this point, especially with the recent movies, if you don’t know the general plot to the Narnia books, you’re probably living under a rock and don’t read this blog in the first place. So I won’t go into it. But fellow Narnia fans should (maybe) read The Magicians, the Lev Grossman book that I blogged about earlier. As a big Narnia/HP fan growing up, I was pretty shocked by Grossman’s treatment of fantasy worlds and magic. I’m actually not sure if fantasy fans would necessarily enjoy The Magicians—but it’s definitely worth a read if you like questioning your own perspective. Has some pretty good meta passages about reading in general, for sure. Have a good weekend! My goals for this weekend include finishing DitCoL and not drowning in small-town ennui. I read a few Terry Pratchett books in middle school (namely because my brother’s National Geographic Kids said he was DanRad’s favorite author), but I don’t really remember them. They all sort of blended together in a blurry humorous fantasy world. In Unseen Academicals, I actually found the humor to be somewhat lacking, or perhaps of a sort that I enjoyed more when I was younger. UA‘s redemption, however, was found in two particular themes that I found very interesting. In a small, small nutshell, UA is the story of Unseen University’s decision to field a football (soccer) team for the first time in years. With rival teams and their fans constantly wreaking havoc both on the field and in the streets of Ankh-Morpork, the wizard professors decide to reinvent the game as a more civilized form of entertainment and sportsmanship. In doing so, they unintentionally deprive the local riffraff of the source of satisfying violence and excitement that the sport had become. The first half of the book contains a handful of encounters between fans of rival teams, all of which carry the threat of street violence. Of course, everyone is familiar with the undying Romeo and Juliet theme of rival gangs warring in the streets, but after watching The Outsiders while in the middle of UE, I thought long and hard about said theme and its applications in the real world. The characters in both works are in very real danger of being jumped in public in broad daylight—or significantly worse. I’m the first to admit that I’ve lived a sheltered life. Growing up in a quiet neighborhood, I’d—perhaps unwisely and certainly to my parents’ distress—never though twice about walking alone at night until around the age of 20. Even after spending last year volunteering at a sexual assault hotline, I’ve never felt seriously afraid of or threatened by someone coming around a dark corner (fact: you are far more likely to be assaulted by someone you know in a private setting). Now, (obviously) the dark corner type of danger is not confined to the works of Shakespeare and Sondheim, and you might just see this as the ramblings of a naïve girl with too much time and security on her hands. But this is why I love to read (and watch movies)! So that I can see what living with the daily threat of physical harm must be like! In the second half of the book, these football-(soccer)-playing street toughs get a little more human when they’re blindsided by the government and university’s decision to regulate their favorite pastime. The toughs are drunk, illiterate, and frankly have no idea what’s going on. As a football (real football) player myself, I understand the need to get a little violent on the playing field. It’s satisfying. It makes you feel like you’re doing something worthwhile. And to have that taken away from you by a self-proclaimed tyrannical government? I mean, sure, Ankh-Morpork was dealing with civilian injuries and deaths at practically every football (soccer) match. But they signed up for it, right? Even the fans! And the players who died young of head injuries and the like—they still had the glory, didn’t they? Disclaimer: I’ve known people who have died or been permanently injured while playing a sport. I don’t mean to trivialize or excuse that. But—coming from a fictional standpoint—don’t you think it would be just a bit tough to have something you love taken away because higher-ups didn’t like it? I mean, haven’t we all felt that way about our parents at some point or another?